There is nothing difficult about shaping kerfing once the kerfs are cut. It can be shaped with a bandsaw, with a power sander, or competely by hand. 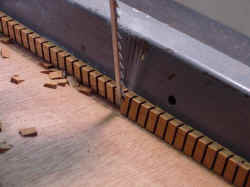 The very triangular kerfing that is often seen on guitars is most easily shaped by starting the work on the bandsaw. The first 2 photos show this type of operation. 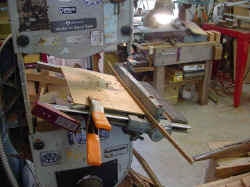 The next 2 photos show the simple holding jig I use when shaping kerfing with a power sander or by hand. It is just a 2 x 6 with a slot cut in it that fits the kerfing. I have different size slots on the 2 edges of the 2 x 6. One for guitar kerfing and one for uke kerfing. The end view shows how the 2 x 6 is cut on an angle to allow shaping of the kerfing. I've use this same piece of wood for many years and you can see that it is no longer straight, but it still works fine. For innitial shaping of the angle the kerfing slips into the grove. 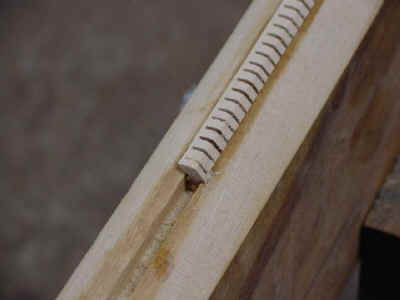 Afterwards, the kerfing can be held at almost any angle for hand sanding by simply letting the slot cradle it. It's not rocket science, but it works for me. Lastly, just some photos of uke kerfing cradled in the jig for final hand sanding.